From a 24×24 to a 32×48 – All completed in 2003! In January of 2003, the Information and Gift Center (IGC) moved to the only original building left from the Simpson era, the Garden House. Photo #1 shows the entry untouched. In photo #2 the large overhead beams in the entry have been removed. This was the first step in building the new entry to the gardens. Photo #3 depicts the complete removal of all the beams and decking. A temporary fence was put in to keep the deer out. On March 19th, the old Information & Gift Center was moved to Sunset Bay Campgrounds, where it will be used as an Interpretive Center for such programs as Jr. Beaver. In its place at Shore Acres State Park, a new Information & Gift Center was built. The old building was 24’x 24′. The replacement is 32’x 48′. The financing for this project did not come from the general fund, but rather from lotto proceeds plus funds from the Friends of Shore Acres (FOSA). The FOSA funds come from your support of the Holiday Lights and revenue from sales in the all-volunteer Information & Gift Center. As of June 7, the foundation walls and wiring conduits were in place. The foundation walls were filled with sand in preparation of the floor being poured. 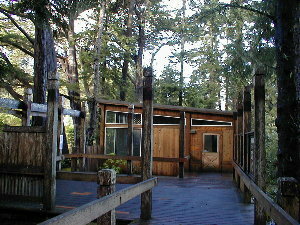 The deck on the garden side of the Info and Gift Center had been framed. The layout of the entry and deck to front of the IGC had been framed. Things were progressing rapidly, much to the fascination of park visitors. Next came the windows, the roof, and the dormers. After that, the columns, the new front entry concrete, and the framing of the gazebo roof. The inside walls were textured and painted and the siding was done. Electrical fixtures were installed, the floor and window trim was finished, and slatwall installed. The finishing touches were added and the doors open to the new Information & Gift Center just in time for the 17th Annual Holiday Lights.